Collectively, these programs reflect important values which add to the total college experience and prepare students as a lifelong learners and citizens. Official copies of student’s and alumnus/na’s Elon Experience Transcript can be ordered along with official academic transcripts through the Registrar’s Office online. Elon University validates all information presented on a student’s Elon Experiences Transcript. Validation occurs within each program responsible for the experience and is then maintained in a centralized system. Students do not personally enter any experiences onto their Elon Experiences Transcript. 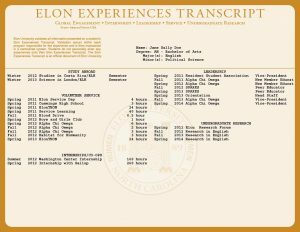 The Elon Experiences Transcript is an official document of Elon University. Elon Experiences Transcripts have been maintained for students continuously since 1994. At preregistration each semester, student’s academic and Elon Experiences transcripts should be used together by a student and their academic advisor to help them plan a well-balanced college career and connect their out-of-class experiences with academic and career goals. In their senior year, they may request and receive an official Elon Experiences Transcript as a supporting document for job or graduate school applications. This innovative program puts Elon graduates ahead of the pack when applying for employment, graduate programs and other post-graduate opportunities. The Elon Experiences Transcript shows employers that you possess skills and experiences that set you apart. The Elon Experiences tracked on the EET are different from the Experiential Learning Requirement (ELR). Currently there is no minimum number of Elon Experiences that students must complete before graduation, however the majority of students will complete several experiences in multiple different areas. Most ELR experiences will show up on the Elon Experiences Transcript, however not all items from the Elon Experiences Transcript will count as an ELR. Make sure to speak with your academic advisor if you have any questions about completing your Experiential Learning Requirement. For more information on a specific Elon Experience, please visit the Elon Experiences Overview page. Corrections to the Elon Experiences Transcript can be made by e-mailing the activity, semester completed, and hours or position (if applicable) to eet@elon.edu. For more information, contact eet@elon.edu.